Did you earn our Crazy Sock Dojo reward? 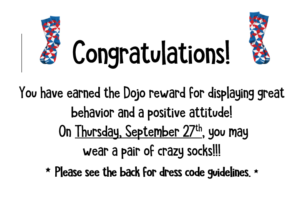 All students who have earned this reward brought home this note and can wear their crazy socks on Thursday, 9/27. Please take note of the rules that go with this fun day.